Remember me saying that I love salad that contain warm elements? Well, this is another one of my favorites. 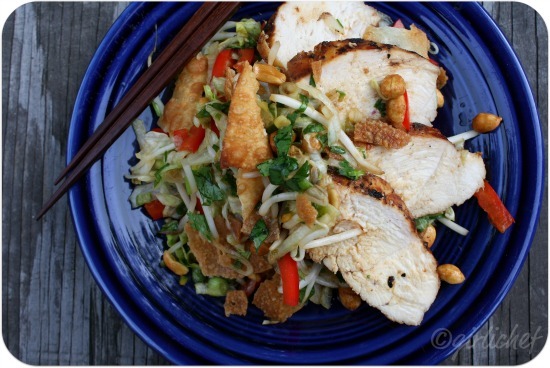 I just love the different crunchy elements all lubed up in an amazingly flavorful vinaigrette with warm, tender bites of chicken throughout. Actually, I suppose you don't really have to serve it with warm chicken...it really doesn't even "call" for it, but I always seem to use warm chicken. But I have had leftovers and enjoyed it equally as well with all of the ingredients at the same temperature. So. That blows that point right out of the water. It definitely doesn't change how amazing this salad-a-meal is. The first time I tried this salad was about 6 months ago when Nigella's new book first came out and I chose it as one of the recipes to try while I was reviewing it. It's stuck ever since. I've made it using leftover poached chicken, rotisserie chicken, and grilled chicken. I've made it by shredding a head of lettuce and by opening a bag of pre-shredded lettuce. I've even subbed honey-roasted peanuts when I realized we were out of regular old salted peanuts. Each addition/substitution was just as good as the rest. I've never switched out the color of bell pepper just because I love those bright red strips laced throughout the salad, but of course you could. Heat ~½" oil in a frying pan and fry the wonton wrappers in batches. Move to a paper towel once they've turned golden and crisped up. Place all of the ingredients for the dressing in a small jar with a tight fitting lid and shake vigorously to combine. *Adding a half or whole breast per person is quite a bit, but if it's your meal, I do not think that it's too much. This salad is very versatile...just try it out and adjust it to your personal tastes. Such a great meal for hot days! Heather, your salad looks so good! Definitely great for a hot, summer day but I would love it anytime. For me to enjoy salad it has to have lots of yummy ingredients (so I don't realize I'm eating salad, lol). This looks wonderful! Me encanta esta receta, me la voy a quedar. Yeah...this one is areal winner. Perfect for summer temps. And it's Nigella, who I love (like you :-) so I will add this to my list for nice summery lunches. Good one!! What a beautiful dish! That sounds delicious. I love that dressing. It dresses up anything. @Ree...hey stranger! Yes, I grilled it. It was actually a five-spice rubbed chicken that I grilled. I'll be posting that recipe later this week if all goes well... Hope you and baby and Daph are doing great! This looks SO good! I adore salads like this. Love the idea of using honey roasted peanuts too! This salad is right up my alley. The wontons are just icing on the cake. I've been eating TONS of salads lately and this one is totally making it onto my list! With the honey roasted peanuts...that sounds super delicious! I love Asian inspired salads. I just made one using millet. You must have gotten in my head! Heather, this look sooo good!! I can't wait to try it. I love all the crispies (won ton wrappers) in it. 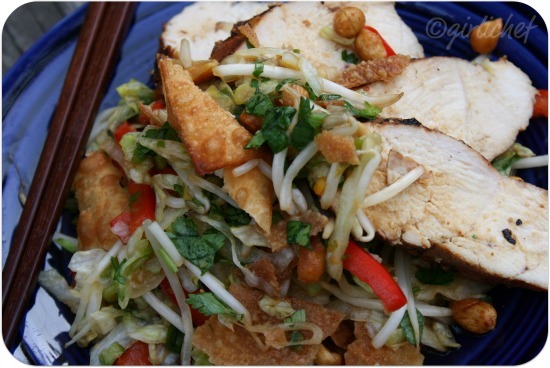 Feel like finishing that whole plate, irresistible salad..
looks really delicious...thanks for sharing your recipe! i like to try it. have a great weekend! a yummy salad indeed!! I love how you always include you tips. We always have leftover chicken and I would love this for a weekday lunch! How is that I own this book yet never took notice of this salad before?! I've been missing out - it looks incredibly good and hits on all the points I too love in a salad! I'm a sucker for any kind of chicken salad. This one looks like a winner! that's a lot of chicken pieces for a salad! I was just thinking about an asian salad. I am curious can the dry powdery form of ginger be used in place of ginger root?I usually have this on hand but I am unsure as to how much I can use to substitute it. 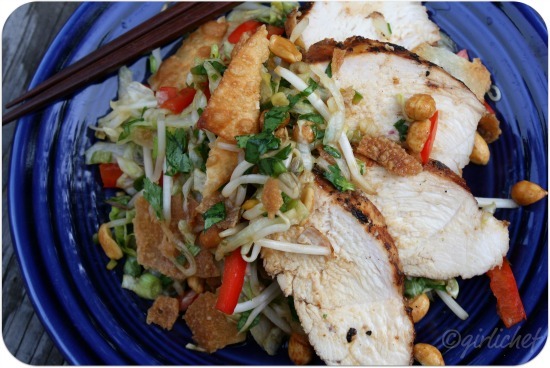 I love Oriental riffs on good old chicken salad - and I like it hot, warm, cold - we love it that much here. The crunch, the sweet and the salt - all in one colorful meal. Yes, will try. This salad looks fantastic! Saving this one, my family would love it! This is my favourite kind of salad too. Yum! You've done it again with this fabulous salad. Oh.my.goodness. This looks SO good! I am so making this. Thank you! 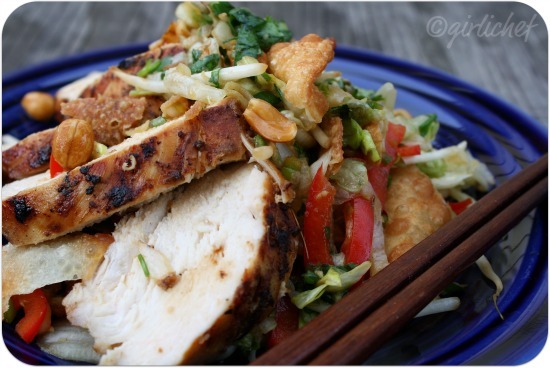 Heather, I just LOVE Chinese Chicken Salads and have GOT to make your version. I love this so much that I featured it today from last week's Fresh Food Friday. It will be posted tonight after a little more to write on my post. Thank you again and I hope that you can share another one of your recipes this week! Good Morning Heather - I've hopped on over from Roz @ la bella vita. I love these type of salads. I am going to make this one! Now following.